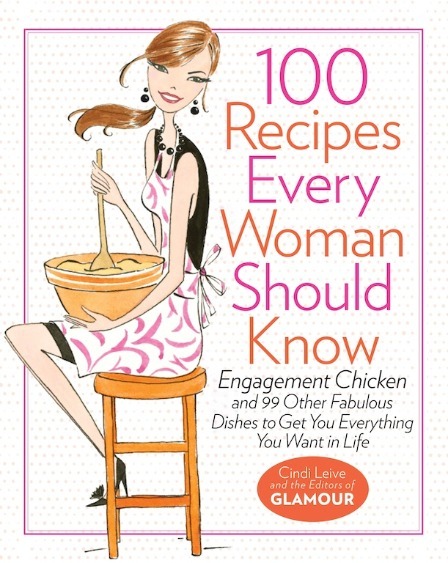 100 Recipes Every Woman Should Know comes from Cindy Leive and the Editors of Glamour Magazine. It begins with the fascinating tale of Engagement Chicken (including an engagement hall of fame...people who made the dish and in turn received a proposal) and the now cult-status recipe for the chicken. It is followed up by 99 equally enticing recipes with fun names like He Stayed Over Omelet, Make it in the Car Artichoke Dip, Forget the Mistake You Made at Work Margarita, Baby, It's Cold Outside Crabmeat Soup, Instant Seduction Pork Chops, Bikini Season Baked Salmon, It's Almost Payday Chili, and Impress His Family Chardonnay Cake just to name a few! If the introduction to the book and the fabulous fairy-tale origins or Engagement Chicken weren't enough, each section is packed with tempting recipes that are accompanied by fun explanations and ideas about when to serve that particular dish. Tucked into some of the sections (which include breakfast & brunch, nibbles, drinks, soups & salads, mains, seafood, pasta, meat-free mains, sides, cheap & easy meals, and sweets) are some great Kitchen Basics such as Five Breakfasts for Very Busy Women or How to Make a Perfect Cheese Plate. Bringing up the rear of this fun, fabulous cookbook is a MENU section in which you can find the perfect way to fit starters, mains, sides, and sweets together for a fabulous dinner party or intimate affair (with some more kitchen basics to help you along). I love the recipes in this cookbook. I think it's the perfect give to give a young woman venturing out to "find herself" and start an independent life. Whether she's going off to college, moving into her first apartment or home, getting engaged (though you may want to get this into her hands before then if she's really wishing it would happen soon...the lore of Engagement Chicken is strong), or even getting married. That said, I think it's a fun addition to any woman's kitchen. I know I've enjoyed it and will continue to cook from it and loan it out to friends. I wanted to include the actual recipe from the book since I'm reviewing it, but I couldn't help myself in changing it up. After all, I'm not in need of a "marry me" lasagna...so I went for a "still married" version of it. Either one will be delicious. My version will include the things in green! I didn't leave out anything called for, just increased a few quantities and added a few extra ingredients. If I make it this way next time (and for some reason, I never seem to make lasagna the same way twice), I will double the ricotta and cottage cheese...and probably increase the mozzarella and parm, too...cheeseslut that I am. Preheat oven to 350° F. Cook lasagna noodles until al dente, drain, and let sit in colander. In a medium bowl, combine ricotta, cottage cheese, eggs, and Italian seasoning. Spread 1 cup marinara sauce on the bottom of a 9" x 13" baking dish (or lasagna pan). Top with a layer of noodles (4), followed by ½ (⅓) of the ricotta mixture. Repeat with second layer of marinara, noodles, and ricotta mixture. Layer spinach over all of this (this will be right in the center of the whole dish). Finish with last layer (do two more layers) of noodles (and ricotta mixture...ending with noodles) and then spread ~¾ marinara over the noodles (leave a little for serving). Sprinkle with mozzarella and parmesan. Slide into the oven and bake for ~1 hour, or until top is golden and filling is bubbling around edges. Noodles will be tender when pierced with a knife. Remove from oven and let cool ~15 minutes before serving. Cut into thick slices and garnish with basil. Serve drizzled with extra marinara (put a spoonful of marinara on plate and serve a slice on top...I like it underneath so as not to mess with my cheesy top layer). I love serving lasagna with a green salad, a loaf of crusty bread, and a bottle of wine...or milk. *I received a free copy of this book to review. I received no compensation and all opinions stated in this post are 100% mine. *Trish of My Slap Happy Kitchen is hosting PPN this week. This sounds like such a fun book Heather! I must try to get hold of a copy. 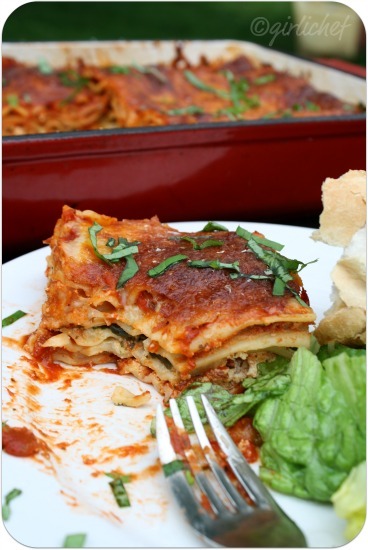 Love the lasagne recipe too - your version looks scrumptious! Sounds like such a fun cookbook! The lasagna looks amazing! Que rica lasaña, es una verdadera delicia. I have been mostly out in the rains..but now again back to civilization..the dish looks yummylicious..and a lot of your posts have been incredible!! Looks yummy and easy! The name - and the cookbook - are hilarious. Love it! 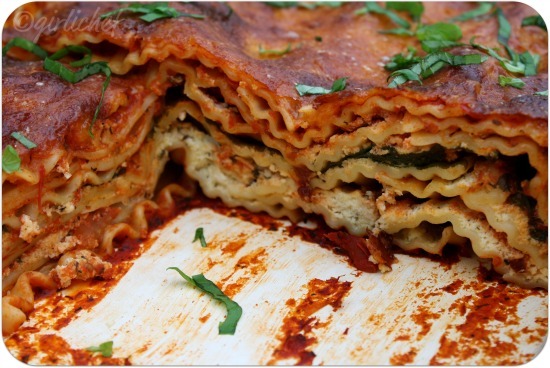 i have got to find this book, it sounds so good, as does that lasagna, oh my gosh, look at those layers! Looks yummy, and it will be fun to read and try out the recipe from the book. This recipe looks great (and not hard as far as lasagnas go). I add spinach to anything I can, too. Serving it with milk though...I'm not sure I can give up a bottle of red! I'm all for making food for other people and making them happy, and your lasagna looks really delicious, but why should only women know these recipes exactly? 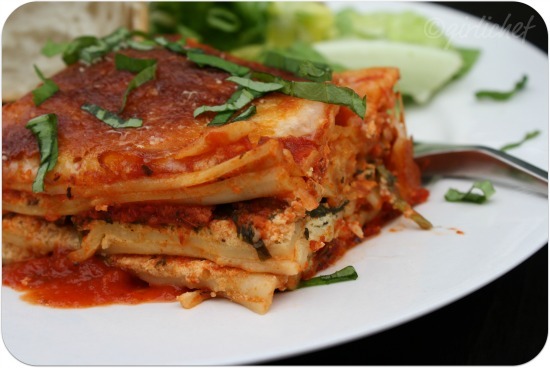 I have never used both cottage cheese and ricotta in lasagna. I use one or the other but I like ricotta and don't love cottage cheese. This is probably a good way to make the most of both cheeses. This would be great for My Meatless Mondays, if you have a minute. What a fun cookbook! The lasagne looks delicious also. estupenda lasagña una verdadera delicia,con ambos quesos exquisitos,cariños y abrazos. twospoons...well, of course not only women should know these recipes, it's just a fun cookbook catering to women (just read the titles of the recipes). 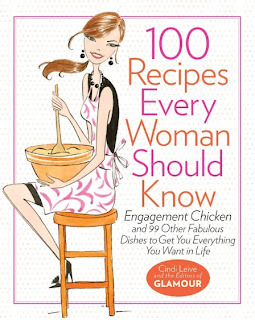 While I'm sure plenty of guys would grab it and flip through, I'm not sure how many would be pleased at being gifted a cookbook with the name "100 Recipes Every Woman Should Know". It's just in fun, I'd never besmirch a man his manly recipes... ha. My grandmother made her lasagna with cottage cheese and I get way excited whenever I see this in a recipe! Oh my god. I need this cookbook! How else am I going to catch a man (I mean...what I'm doing now obviously isn't working). LOVE that lasagna! This sounds like a fun book! The lasagna looks wonderful :) I'm especially interested in the chardonnay cake. Great book review and meal! AND, I am really digging your new layout. I've spent a good part of an hour just surfing your blog! Lovely and funny names for the recipe. Just reading at them make you want to cook the recipes ans see the results. "Quit being an insensitive jerk, why'd you forget to take the trash out again, all men are lying HOTdogs." All of your additions sound like good ones. But that is from one cheeseslut to another! Sounds like a fun cookbook! I am still staring at your lasagna, looks simply wonderful! This is too cute! I totally need to make some Engagement Chicken, lol! I was snooping around your blog and came across this review... thanks so much! I bought this book for a Christmas present for myself and it has been one of the best cook books I have ever got. My sixteen year old loves it too. We have not found a recipe in the book that we didn't like. Thank you Glamour and Cindy.